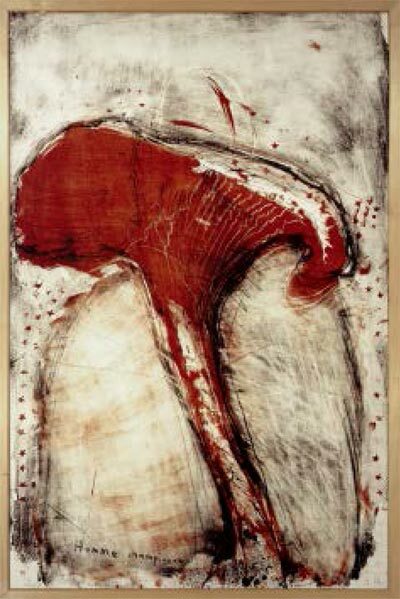 The work of Rolf Iseli (born in 1934 in Bern) reflects the evolution of 20th century art from Abstract Expressionism, through Action Painting and Pop Art, to New Realism and Arte Povera. His paintings stirred interest in Switzerland early enough, and in 1957 Iseli won the Swiss Federation Art Scholarship for a canvas covered in splashes of ink, causing a scandal in the world of Swiss art. His first paintings caused heated controversy and as a result, Iseli became known as a predecessor of Action Painting in Switzerland. He participated in many "Documenta" in Kassel, biennales, individual and group exhibitions, all of which testifies to the international dimension of his work. 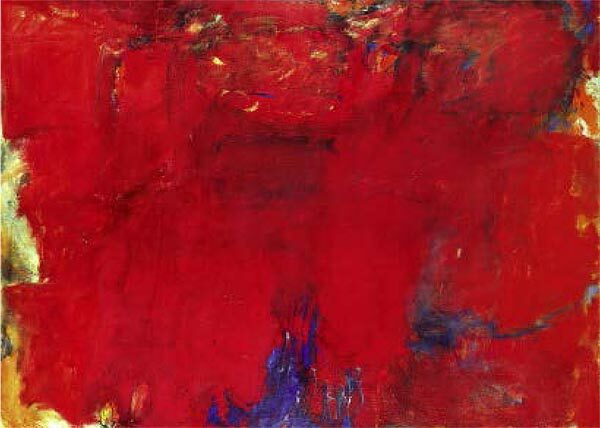 In the 1950s, while working in Arnold Riidlinger's artistic laboratory in Bern, Iseli made one of the most intense and radical contributions to Abstract Expressionism in Switzerland. He also worked in Paris and New York where he met such great American artists as Sam Francis, Al Held, Barnett Newman and Mark Rothko. In 1970s, after a long period of devoting himself to sculpture and objects, Iseli turned to the so-called "earth pictures", inspired by his vineyards in Saint-Romain in Burgundy, where he had a second home. The main subject of these paintings is man and his natural environment. During this period, Iseli created powerful apocalyptic landscapes in which human figures crop up in their original state. The artist was processing materials from his immediate surroundings, such as earth, feathers, spines, agava leaves but also used objects, like rusty nails, barbed wire and fabric. His work combines painting and drawing, collage and print, sculpture and object, materials and text, which together form an indissociable symbiosis. His art evolves "in between" traditional genres, making it hard to attribute it to any particular artistic group or movement - instead, it is the result of an independent lifestyle in the isolated universe of nature. 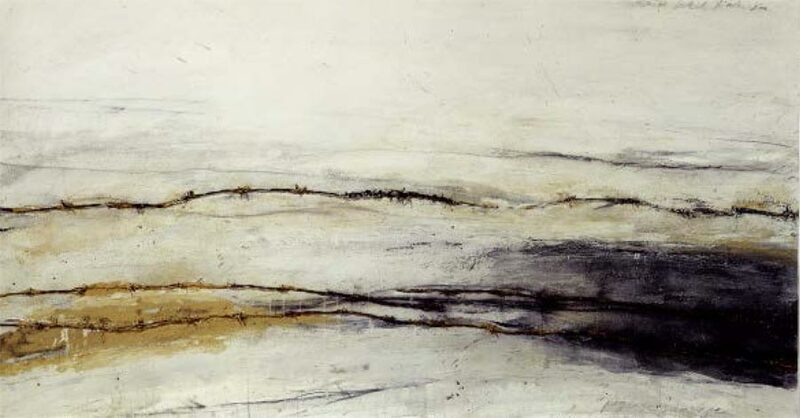 The exhibition is called "Layers of Time" and evokes the strata of the earth. In the philosophy of history the word is used to talk about historical layers which exist simultaneously. With such an idea, Iseli's work has been grouped chronologically and thematically giving an overview of the main layers and leitmotifs of his fifty-year artistic career. It consists of six thematic sections introducing about 90 pictures, graphic works and sculptures. Though they have never been shown at his large monographic exhibitions at the Museum of Fine Arts in Bern, Iseli's works have always been present in the city. Due to gallery and group exhibitions by the mid-1950s the artist had quickly evolved to become an ambitious young action painter. Later Swiss curators and art supporters like Harald Szeemann, Arnold Rdlinger, Georg Schmidt, Max Huggler, Max von Mhlenen and Eberhard W. Kornfeld more than once paid attention to his works. Important stages in the public recognition of Iseli's art came with his participation in the "Documenta" at Kassel, both in 1959 within the International Abstraction art festival, and in 1972 within Harald Szeemann's "Individual Mythology"; at some exhibitions from the late 1970s through the 1990s in major museums at home and abroad; and also during the discussion of his works at group exhibitions, which brought him to galleries and museums from Moscow to the Museum of Modern Art in New York, and showed the international importance of the artistic content of Iseli's works. "ЛТ1 That makes Rolf Iseli's creative work VV into a whole?" 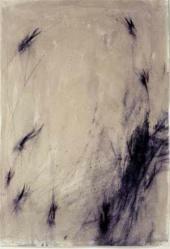 is the question of representation of the painter's encounter with the space surrounding him. When he was an apprentice studying colour- and photo-lithography, he was able to see Paul Cezanne's St. Victoire mountain on site. After he became an action painter, it was the physical measurement of the space of the studio, subsequently reflected in his picture. 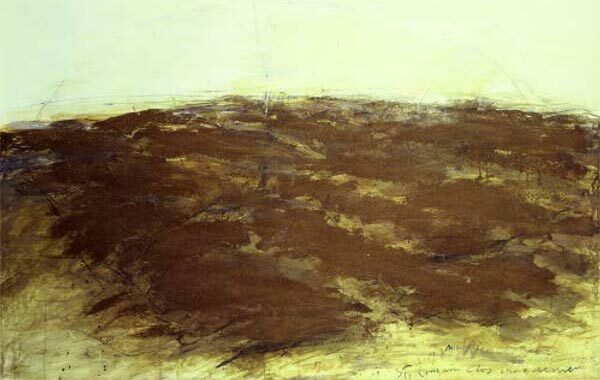 The colourfield painting of the 1960s that followed, he perceived as flat owing to his new interpretation of space perception which — in the painter's words — "attracted him more and more". The objects of his next phase he placed in public establishments. 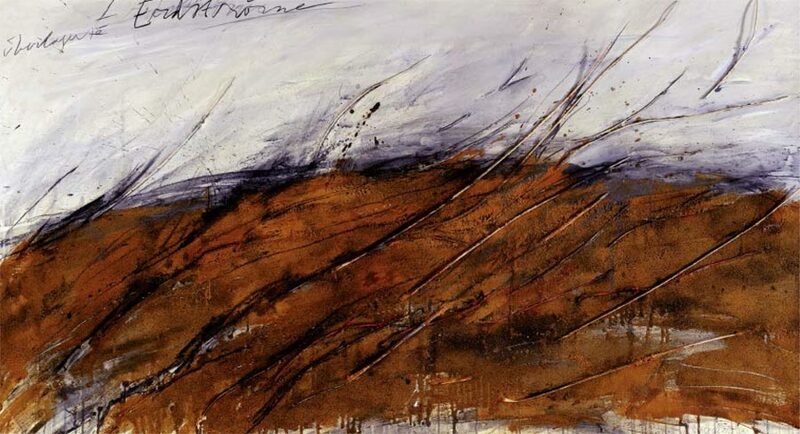 And his creative development after 1971, during which he made a transition to the "material picture" and determined his distinct style, was caused by his encounter with the landscape of Burgundy, and then expanded due to his residence in the Spanish town of Javea (Xabia). Visually, Iseli linked the figure and the space, most conspicuously shown in pictures like "Currents Around the Figure" (Stromungen um die Figuren) and "Space Around the Figure" (Raum um die Figuren). He links the formal task of determining the relationship between the figure and the pictorial ground in a new way with the existential purpose of the human being: the relationship between the human being and space, his insecurity in space and fear of space become the painter's theme. Earth as a material and the human figure as subject determine Iseli's art during the second extensive period of his career as a painter. In 1971, in his studio in Saint-Romain, he created his first "earth picture", introducing concrete reality. Earth as material is associated in Iseli's art as a new starting point, new opportunities for expressiveness, as well as a new sense. Earth is perceived as mythic power, the birth-giving Mother, the basis of nature, the place where the human being lives, and as the terrain. Different degrees of reality and relationship transit between one another: image and material, material picture and object symbol. The earth picture is associated with a figure from the earth, introducing "homme de terre" in 1972. Later, the human figures transformed into "homme champignon", "homme cactus", "homme du jonc", and into "Spring people". On the one hand, they were understood as material symbols of belonging to the earth, nature, and integrity; on the other, the human figure refers to the painter's experience of himself, which, since 1971, has been reflected in his shadow figures. 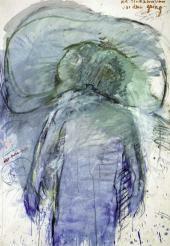 At the beginning of the 1980s, the painter focused on portraits or self-portraits, producing such works as "The Listening" (Horcher). Grey colours in grey, or the shapes of head profiles seem to be zones of silence, metamorphoses of the world, looking inside oneself or listening to the inner self — but also of listening to the elements of nature. In Iseli's work, "The Listening" is the result of the painter's own experience of himself: his openness and closedness, his sensual and spiritual existence, and his origin in general, and at the same time his desolation, the probability of getting mixed up, and exposure to threat in today's world. Thus, the question about the identity between art and life becomes the central theme of Iseli's creative work and finds very personal and exact reflection in his works. His life in Saint-Romain, work in his vineyard there, return to nature, both his fate and choice, constitute the terms and conditions of the above-mentioned identity and Iseli's art. From this angle, his creative work is more way of life than production, and the words about the "personal mythology" which in 1972 Harald Szeemann called one of the objectives of art of the second half of the 20th century "the private study of reality," acquire exact meaning. The unknown is for Rolf Iseli the bosom of nature and existence of the human being. The double theme of Rolf Iseli's art implies the following: his pictures and graphic works, contain an antithesis of "human being — nature", which in turn becomes a synthesis.